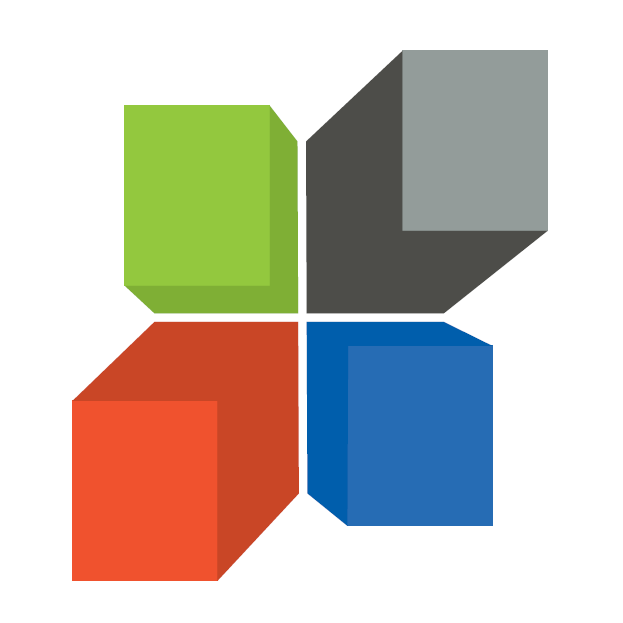 We have been working for the past few months to upgrade some of our solutions to CRM 2013. Microsoft Dynamics CRM 2013 comes out of the box with a free tablet application for windows 8 and Ipad, thus we decided to update the SMS solution so it will work with the tablet application as well as the browser. We maintained all the functionality which includes sending single and bulk SMS to static and dynamic marketing lists, also defining multiple SMS profiles. The main advantage for marketing, sales, service or xrm users is that they can send SMS notifications to their contact database on the go and directly from their tablet. The video below demonstrates the power of the Microsoft Dynamics CRM platform as the first solution was created for CRM 2011, it was later fine tuned for CRM 2013 so it will work on several applications. An amazing video from WPC 2013 showcasing CRM 2013, the future release of Dynamics CRM and the roadmap. The release is called "Orion" and is expected by end of year. 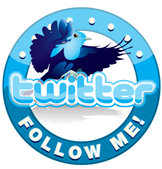 It’s been a while since I last added a new blog post, and I am wondering why!! Guess I was a bit busy and lazy at the same time :) but I promise that I will try to blog more and write new interesting posts as the days go by. This has been a busy week for Microsoft Dynamics CRM. Microsoft announced the December 2012 service update for Microsoft Dynamics CRM online and a new statement of direction which outlines Microsoft investment in the platform and the new range of functionality that Microsoft will be delivering on the short and long term. Update Rollup 10 (v. 05.00.9690.2730) for CRM 2011 was released yesterday, You can download the Update Rollup here and the KB article here. Note that Update Rollup 9 for Microsoft Dynamics CRM 2011 will not be released because of a delay in the Q2 Service Update. Update Rollup 10 fixes all the issues that would have been included in Update Rollup 9. 2- The customer care accelerator will match the call against a CRM record, opens the record and creates a phone call activity as soon as the Operator accepts the call. 3- The CRM operator then checks for available operators and transfers the call to a collegue (do2.ptg) or any phone number depending on the case in question. 4- The second operator (do2.ptg) will receive the transfer call along with the data needed to identify the customer (test1.ptg) and repeat the same steps as point 2. Watch in full screen here. 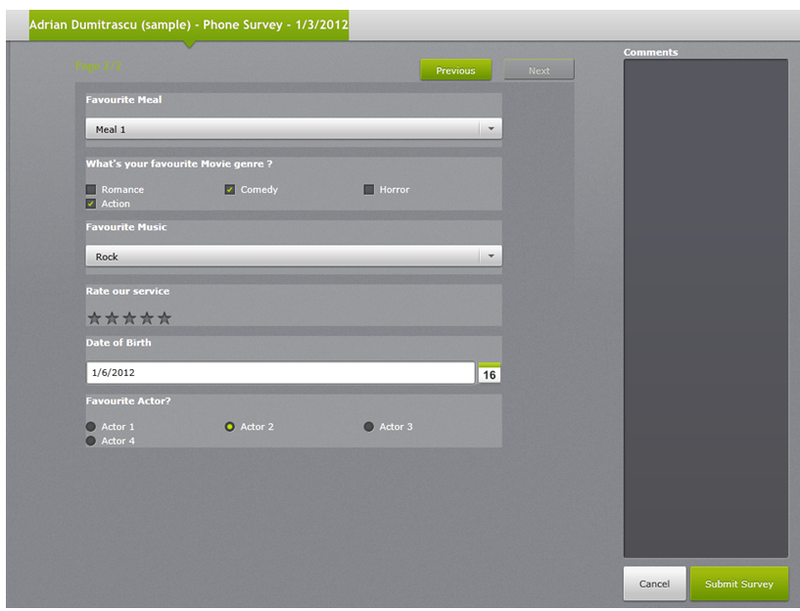 Dynamic Objects Phone Survey is a Microsoft Dynamics CRM 2011 Silverlight Solution that provides CRM 2011 users with the flexibility of creating and configuring multiple phone surveys. 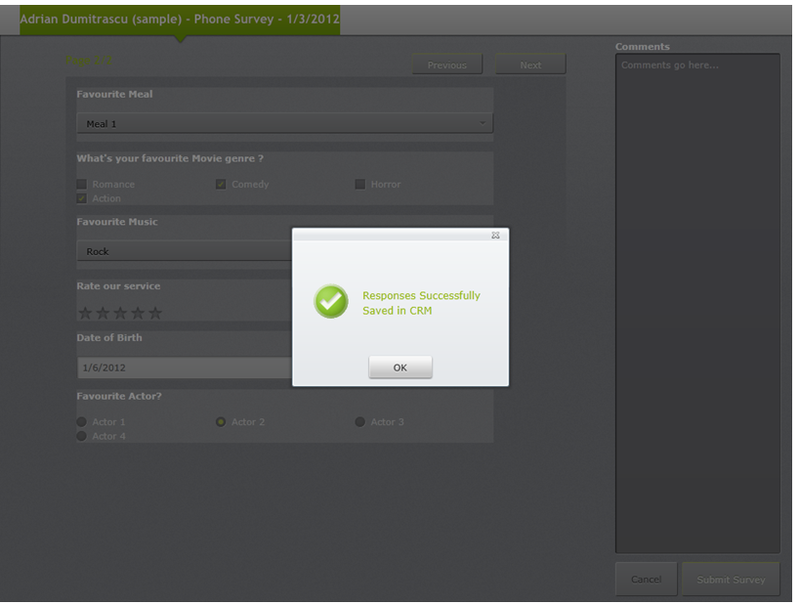 The solution works best for operators conducting a quick survey over the phone for their contact records. It is an alternate and easy to configure solution compared to setting up CRM 2011 dialogs to capture survey based information. For more information about the phone survey please Contact us. 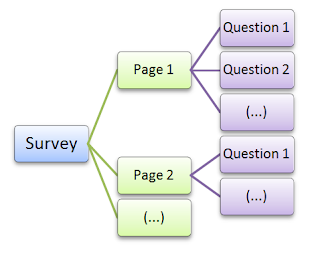 Each survey consists of a container (i.e survey configurator) which houses multiple pages with multiple questions. A simple text-box that holds a text value. A Multiple line text box. A radio button is used when you have multiple answers but you can only choose one answer. Lookups are similar to the CRM Lookups in terms of functionality. Lookups have already defined values, which the user can select either by choosing it using the List Dialog, or by typing in the textbox using the autocomplete feature. Users can still type values that are not available among the predefined options, DO Survey will automatically add those values to the configuration for future selection. Only Active Surveys (i.e. 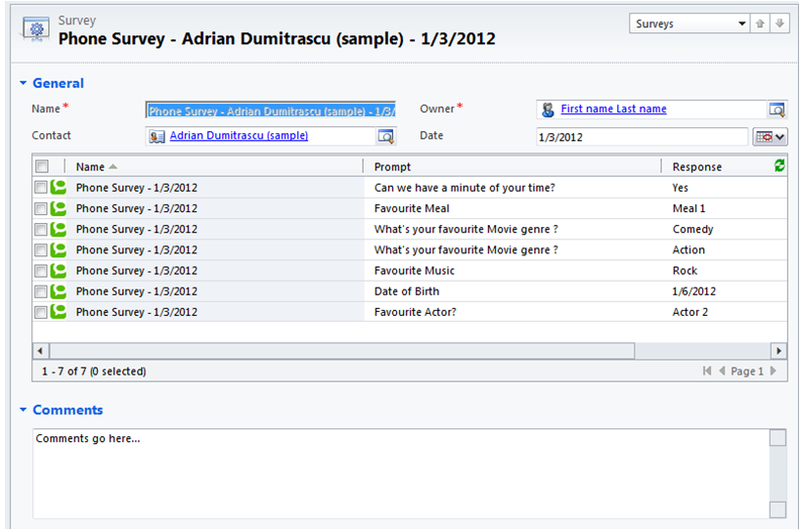 Status = Active) are shown in the survey selector. 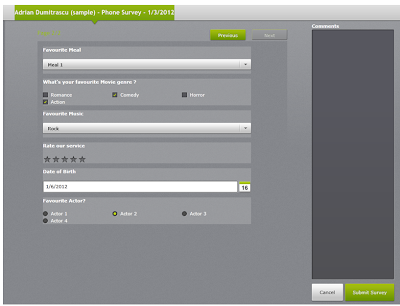 As shown above, the user will also have the option to add comments. 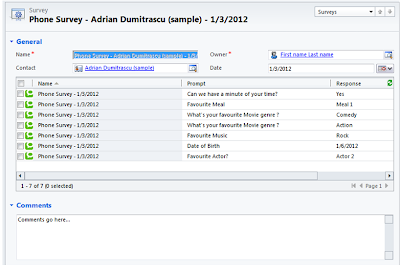 After filling all the data, the “Submit Survey” button will add the responses under the contact. Last week Microsoft released the preview guide for the Q2 2012 Service Update which includes Cross browser support, a much anticipated feature. This means that the CRM Web Client will run across a wider range of browsers and platforms in addition to Internet Explorer such as Firefox, Safari and Google chrome. Without committing to a specific date, the update includes other new features such as a mobility ( a new mobile application for the main smartphones and tablets out there|), enhanced social capabilities, industry solution templates and support for SQL server 2012. This is really something i am looking forward too in 2012.